Haight Ashbury has become an international destination for youth who come seeking refuge from abusive families, alienating foster care and group home situations, and juvenile justice system involvement. However, Haight Ashbury does not always provide the relief they’ve sought. These homeless young people encounter constant threats to both their physical and mental health while on the streets. HYA provides a sanctuary for homeless youth, ages 13-29, who find themselves in Haight Ashbury and Golden Gate Park. Most homeless youth service providers in San Francisco rely on a strict series of rules and top-down imposed goals for their clients. While these goals have helped many homeless youth transition off the streets, there are still many who are unable to fit the rigid set of rules enforced by well-meaning but out-of-touch case workers, most of whom have never been through any of the things they are so readily giving advice about. HYA reaches out to these youth who fall through the cracks, and lets them know that they have a home at HYA. HYA’s participants, the most “hard-core” subset of homeless youth in San Francisco, access medical and mental health services, harm-reduction education, and referrals in a safe and non-judgmental environment. 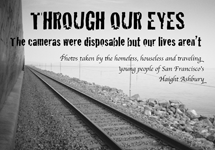 Most of HYA’s outreach staff has personal experience with homelessness and addiction, and so are able to connect more deeply and honestly with Haight Ashbury’s homeless youth.